The tools used by the IRS to collect delinquent federal taxes have been characterized as an arsenal of formidable weapons. 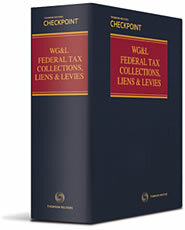 To balance the scales for taxpayers and their advisors, comes the leading treatise, Federal Tax Collection, Lien and Levies by William D. Elliott. Organized loosely around the IRS procedure for collecting delinquent taxes, this treatise starts with the tax assessment and continually offers strategies and tips for practitioners to discover when to challenge a tax assessment.